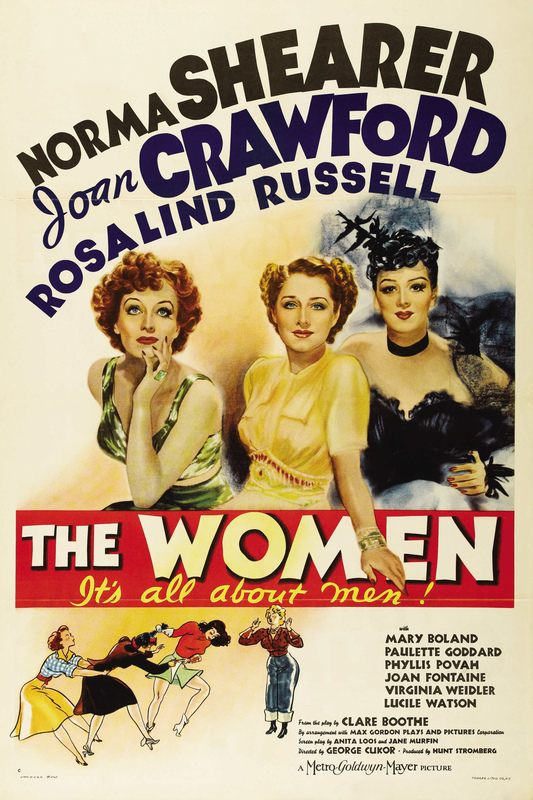 A note from Lindsey: Exactly a year ago today I published a post about 1939’s The Women, which I had discovered two days earlier. (I posted a very tiny review of it.) Here’s another look at the film, which became an instant favorite and was viewed multiple times last year. 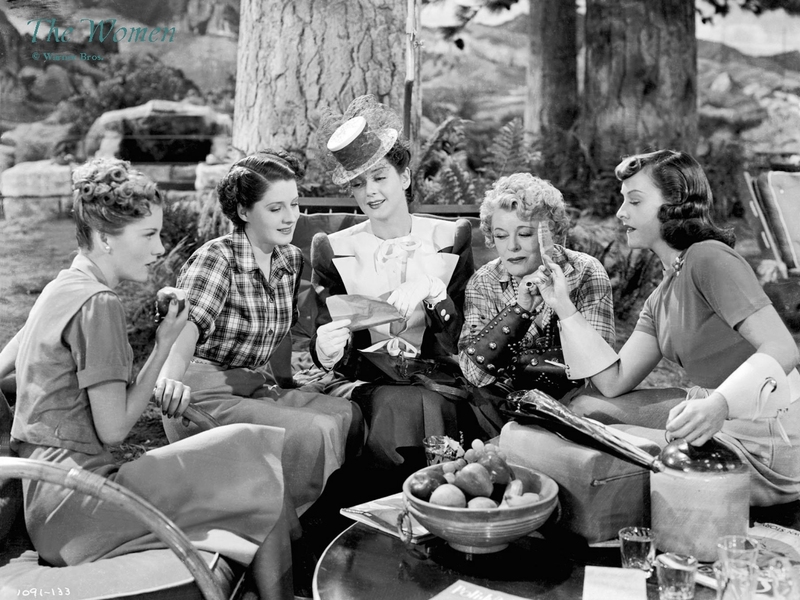 The Women, a 1939 comedy with an all-female cast, directed by the ever-amazing George Cukor. Mary Haines has no clue that her husband is having an affair with a shopgirl named Crystal Allen – no clue, that is, until her gossipy friend’s manicurist lets the cat out of the bag. Drama ensues for Mary and all of the women in her social circle, including a dressing room showdown and a cat fight on a Reno ranch. No doubles were used in the big fight scene between Roz and Paulette Goddard. Goddard ended up with a permanent scar from when Roz bit her during the filming of the scene, but the two actresses remained friends. Even the animals used in the film (horses, dogs, etc.) are female. Myrna Loy was considered for the role of Crystal Allen. She and Garbo are the only big MGM actresses who don’t appear in the film. F. Scott Fitzgerald contributed to the screenplay, but is uncredited. Had Cukor not been fired from Gone with the Wind, he would not have been able to make this film. It was because he was suddenly available that he became the director of The Women. Film debut of Butterfly McQueen, who also appeared in Gone with the Wind during the same year. 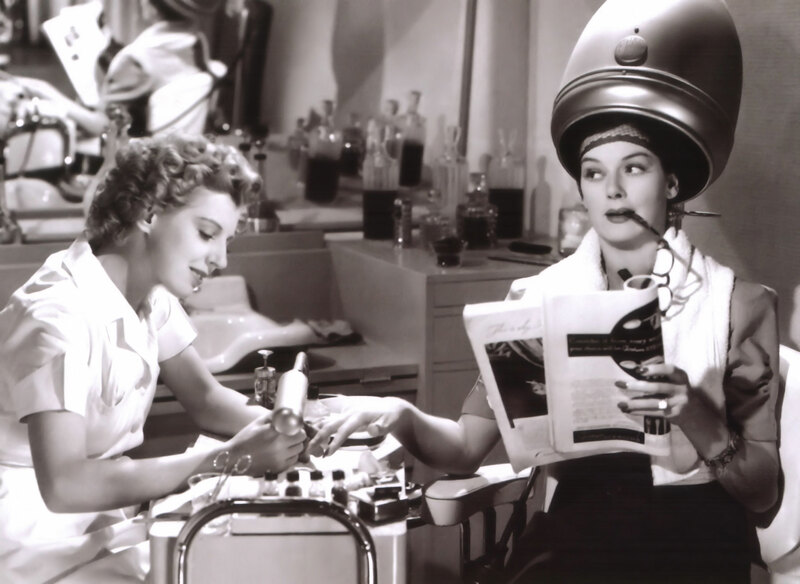 The beauty salon in the film is a copy of Elizabeth Arden’s New York City salon. Joan Fontaine is the last surviving member of the film’s principal cast. The large, square-cut ring that Mary wears in the beginning of the film was worth $175,000 at the time of filming. There are about 130 speaking roles in the film. The film has a quite hectic pace from the beginning, making it a very exciting watch. Everything about Sylvia. She’s so catty and hilarious. The overly-chatty manicurist not realizing who Mary is. Even the housekeepers are gossips! My movie-tracking lists include discoveries, re-watches and multiple viewings, so it isn’t as crazy as it sounds (and I get plenty of sleep!). Only about 70% of the films I watched last year were “new to me,” so I had plenty of time for re-watching. There are a few films I always end up watching at least a couple of times a year — The Women, To Catch a Thief, The Big Sleep, Mr. Blandings. They’re my equivalent of comfort food! I’ve got a few of those ‘comfort’ movies, too! Jaws is only once a year, but it’s EVERY year on the 4th of July…I think I’ve seen that well over 30 time by now. I have streaming and DVD. The best way to attack streaming is to build a queue by browsing rather than searching, because they have a ton of hidden gems but don’t have the rights to a lot of the “true” classics. I like to go into the different genre browsing pages and sort by release year, then scroll all the way to the bottom for the old movies. There are a lot of films I wish they had, but I can’t fault the instant service because it’s been such a great discovery tool for me! Good idea…I’ll give it a try! If worst comes to worst, I’ll have to start the DVD-by-mail service, too, just so I can keep up with the other two DK reviewers! Thanks for the tip…I’ve already discovered a few gems after just a few minutes of browsing! This post definitely made me smile, as The Women also one of my all-time favorites, and it was nice to remember some of the things you pointed out. I think my favorite bit is the exercise scene; the juxtaposition of Sylvia and Peggy and then the instructor trying to keep order just make it hilarious. I would also underline “everything about Sylvia” – pretty much every scene she’s in is gold. The character is basically the reason I’m the big Roz Russell fan than I am. His Girl Friday turned me into a fan of Roz, Auntie Mame turned me into a BIG fan of her, but this is definitely my favorite of her roles. She was such a fantastic comedic actress — one of the best the world will ever see. I didn’t realize all the animals were female, too. “The Women” is not among my faves, but there are a lot of things to enjoy about it.